The wait for the next global financial crisis is over. Major currencies all over the planet are in a “death spiral”, many global stock markets are crashing, and economic activity is beginning to decline at a stunning rate in quite a few nations. Over the past 16 years, the emerging market debt bubble has grown from 9 trillion dollars to 63 trillion dollars. Yes, you read that correctly. 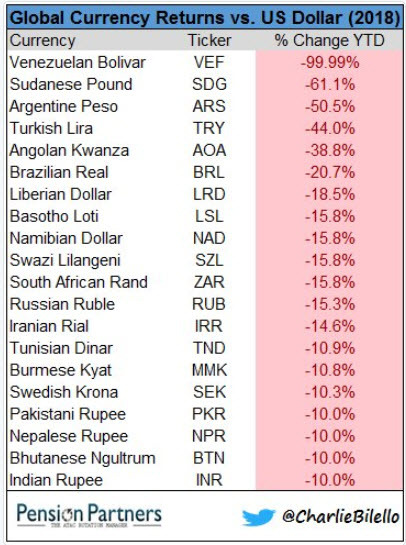 Now that emerging market debt bubble is imploding, and as a result, emerging market currencies all over the globe are in “complete meltdown”. In fact, at least 20 different currencies have fallen by double-digit percentages against the U.S. dollar so far in 2018, and nobody is quite sure what is going to happen next. Of course, this bubble was going to burst.